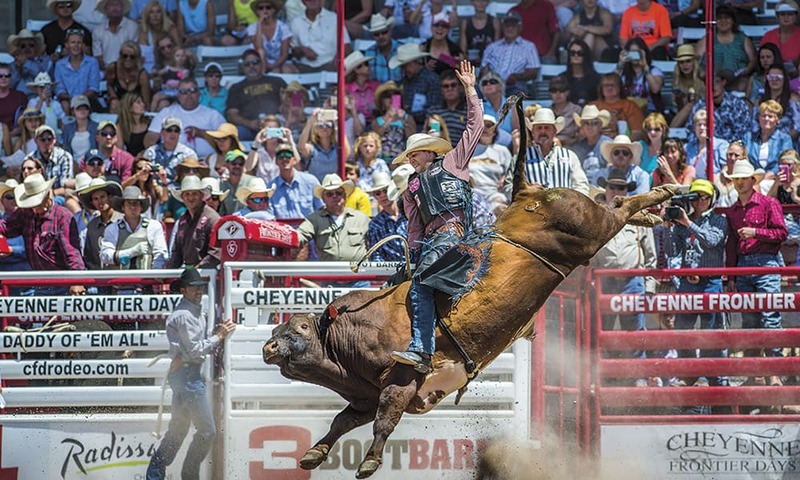 Cheyenne Frontier Days Gets Ready To Kick Up Some Dust! Saddle up July 20-29, and see why the 122-year-old marvel continues to captivate audiences today. Rodeo action at Cheyenne Frontier Days. In the frontier West of a young United States, cowboys roamed the vast expanses of land as they tended cattle on the open prairie. After months out on the range, the cowboys returned to their ranches, sometimes partaking in friendly bucking-horse competitions with other cowboys in the area. On September 23, 1897, organizers harnessed the spirit of these impromptu matches of cowboy skill, and the “Daddy of ’em All” was born. Since then, Cheyenne Frontier Days has been at the heart of the cowboy way of life. Not only is there a major PRCA Rodeo (CFD received the PRCA Large Outdoor Rodeo Of The Year award for the sixteenth time), 30 of the top PBR riders will compete in the championship round for PBR world points. When the sun goes down each night, the stars come out in the form of musical acts including the likes of Florida Georgia Line, Cole Swindell, Eric Church, Toby Keith, and Dierks Bentley. Saddle up July 20-29, and see why the 122-year-old marvel continues to captivate audiences today. Visit cfdrodeo.com for more information. Meet Keri Sheffield, The ICU Nurse Who Became Miss Rodeo America 2018!